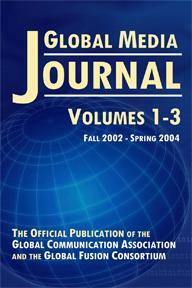 The first issue of Global Media Journal was launched online in fall of 2002 (http://lass.calumet.purdue.edu/cca/gmj/). Since then, this groundbreaking open-access publication has steadily and firmly established itself as a journal that addresses the diverse interests of students, teachers, scholars, researchers, and institutions engaged in international activities, particularly communication. However, until now, the GMJ was available only online. Publication of these two books, which contain articles published in the first five years of its inception, through 2006, will give readers easier access to the material as well as help preserve the journal for future generations. GMJ publishes works that assess media structures and practices, such as global media concentration, globalization of TV genres, global media and consumer culture, the role of media in democratic governance and global justice, propaganda, media reception and cultural practice, commercialization of news, new media technologies, media regulations, regional media, alternative media, and other timely issues. Each issue of GMJ focuses on a particular theme, topic, or region of the world. GMJ is hosted by the Department of Communication and Creative Arts at Purdue University Calumet and its various editions are sponsored by major universities throughout the world. GMJ is the official publication of the Global Communication Association (www.globalcomassociation.com) and Global Fusion Consortium (www.globalfusion.siu.edu). A selected number of papers presented at the annual conferences of GCA and GFC are published in this journal. Dr. Yahya R. Kamalipour is founder and managing editor of GMJ and head of the Department of Communication and Creative Arts at Purdue University Calumet.